Chill offers ice adventures, culture and cuisine from around the world in this celebration of the season at The Queen Mary. 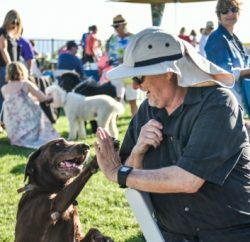 In eternally sunny Southern California, it’s rare to experience a true winter with ice and snow and all the fun that comes with it. 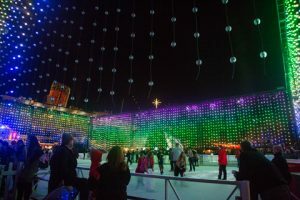 But, for a few short weeks, The Queen Mary—in Long Beach, just a few miles away from Orange County—presents Chill, a winter wonderland billed as the country’s first ice adventure park, through Jan. 7. 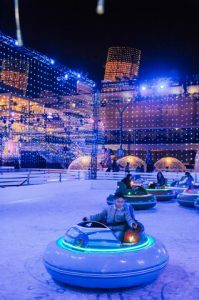 Plenty of thrilling cold-weather activities await for the whole family, from ice skating to tubing down a 140-foot hill to driving bumper cars on ice and riding tricycles equipped with metal bolt-studded tires for better grip around an ice track. There’s even a zip line and ice shuffleboard. In addition to these exciting experiences, the event is also a great way to embrace the spirit of the season as this year’s theme is holiday traditions from around the world. Set up in front of The Queen Mary, where Dark Harbor takes place during the fall, the area is divided into sections representing different countries, each featuring food and fun from that culture for an international expedition. In Germany, enjoy a beer tasting session—or a flight of root beer, cream soda and ginger ale for the little ones—then nosh on schnitzel, bratwurst or a giant pretzel. A teahouse and dumpling stand can be found in China’s corner while breakfast and cocktails like the Mistletoe Fizz made with gin (which originated in Holland) are served for dinner in the Windmill Waffle House. Elsewhere, indulge in Swiss fondue or sample pierogi, stroganoff, stew or borscht (beet soup) in Russia. 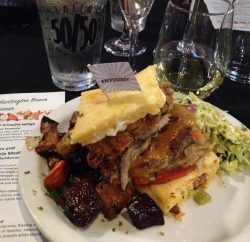 These items are available for purchase individually, or buy a Taste of Chill Passport to try a total of six dishes at select locations or a Drink Passport for six cocktails like The Cookie, a sweet sip on the Alpine Lodge’s second floor, or a martini at the bar inside the Northern Lights Experience dome, which also features light shows. Another option is to don a parka in Russia’s Pinnacle Palace Ice Bar and order a flight of vodka from around the globe. Or, roast marshmallows over a fire pit on the Alpine Patio in Switzerland. “Igloos,” clear domes with comfy couches, can be reserved at an additional cost for private parties of up to 10 guests; each comes with a service attendant. But, with so much to do and see here, you won’t want to stay in the igloo all night. 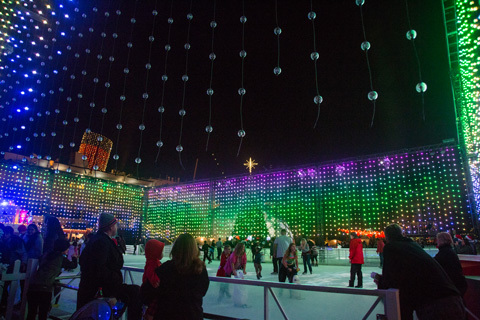 Icy adventures abound and seemingly endless strands of colorful lights transform the 38,000-square-foot space into a magical scene. Holiday gift bringers are also strolling the grounds. Visitors will no doubt recognize Santa and Mrs. Claus, and also have the chance to meet Sinterklaas from Holland, Kristkindle from Germany, Father Frost and the Snow Maiden in Russia. And make sure to meet Father Time, who is not only fun to talk to, but performs card tricks right before your eyes. All of the gift bringers come together for a special show to light the Christmas tree each night. Be sure to stay for the fireworks on Sunday nights and catch live performances by aerial acrobats, Shaolin monks, the Chilette dance troupe, a German band and more. More holiday activities include visiting Santa at his cabin, decorating stockings with the help of elves, making gingerbread creations and listening to a story read by Mrs. Claus, followed by hot cocoa. In The Queen Mary’s theater, there’s even a sprinkling of snow during a 4-D movie “Rudolph the Red-Nosed Reindeer” for a perfect way to celebrate the season. The event runs from 4:30-11 p.m. daily except Dec. 31, when it’s closed. 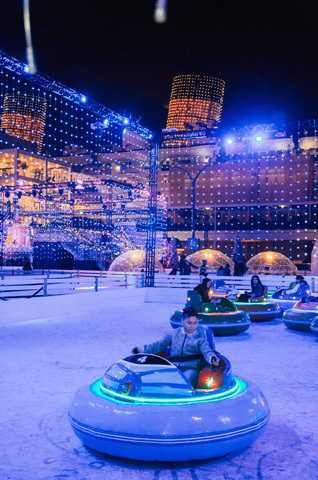 Tickets start at $29 for adults and $19 for children ages 4-8, when purchased online, and include ice skating and skate rental, ice tubing, riding the world’s largest rocking horse, all live entertainment and admission aboard The Queen Mary. Additional fees are charged for other activities. Or, opt for an Ultimate Expedition pass—$79 for adults and $69 for children, when purchased online—which includes admission to more activities and provides express access. For more information, visit queenmary.com.